Truly one of the hardest working folks in dance music, in the past year Boys Noize has toured Europe, the US, Asia, Australia and South Africa and somehow also found time to team up with Skrillex to form Dog Blood, releasing two EP’s and lighting up stages all over the world including Glastonbury, Coachella, Lollapalooza, and Electric Zoo in the process. ‘Out Of The Black – The Remixes’ consists of 10 tracks with a running time of appoximately 55 minutes. The album is a sonic delight, showcasing an array of electronic sounds, and boasting a similar appeal to that of a Chemical Brothers record with much of its songcraft likely to appeal to dance music fans and rock fans alike. The “XTC (MMM Remix – Boys Noise Rework)” is an absolute killer tune and it’s no surprise that Chemical Brothers also elected to remix the track (which is also featured here). In fact, “XTC” has all the characteristics of a Chemical Brothers track (hear “Don’t Think”) with its driving Moroder-style synth work and killer dynamics. Plain and simple, this MMM remix is an out-and-out banger. The brilliant “Conchord (Oliver Remix)” is an album highlight and arguably the most straight-up and dance-floor ready of all the tracks. Oliver’s remix is made up of pulsating synth rhythms and a punchy as f**k production. The Justice remix of “Ich R U” is a dark and retro-sounding reworking driven by massive, swarming synths which are contrasted by some swanky funk guitar. Definitely one of the more odd-ball but unique remixes on the record. Offering the first vocal-driven track, and bringing with it some pop flavour, is the earlier mentioned Blood Diamonds remix of “Got It” which changes the tone and feel of the record, which up until this point is hard-hitting. Continuing the pop element is the excellent Chromeo remix of “What You Want” which introduces some Daft Punk inspired French house sounds with 70’s infused grooves complete with vocoder, kitschy sci-fi synths, and funk-guitar. Killer stuff. Next up is, dare we say, our personal favourite track on the record: “XTC (The Chemical Brothers Remix)”. Where some remixers, such as the aforementioned Chromeo, bring the funk and novel sounds of yesteryear, The Chemical Brothers bring the exhilaration. This one is built for raving. An astonishing remix with the energy of their classic, ‘Dig Your Own Hole’. The delightfully odd and liquid-y, “Stop (Audion’s Acid State Remix)” follows next and is certainly a stand out track full of blasting laser beams and production quirks. Of his remix Matthew Dear/Audion says, “My aim was to take the rise and fall of the original song, but engross it within a completely different system of layers and groove”. And that he does. Likewise, the Housemeister remix of “Circus Full of Clowns” is one of the most immediately distinctive remixes. Housemeister says, “When I received the remix request, I knew what I wanted to do immediately – to bring the ‘clowns’ from dark to light, from rap to techno and ready for the dance floor circus!”. Housemeister’s remix is a grainy collage of retro rap and retro techno sounds, vocal loops, all wrapped up in a massively-digitized production. Things take off when these early, “primitive” electronic sounds combine with a driving house-beat which drops around 1:05, sending this tune straight onto the dance-floor. Excellent, excellent stuff. An extremely fun and thrilling collection, ‘Out of the Black – The Remixes’ follows the Boys Noize ‘Go Hard’ EP from 2013 (read our review), debut album ‘Oi Oi Oi’ (2007), and 2009’s ‘POWER’ full-length. In the last few months, Alex has also released his highly acclaimed FABRICLIVE 72 and BNR’s ‘Boysnoize Present Dance Mania’. 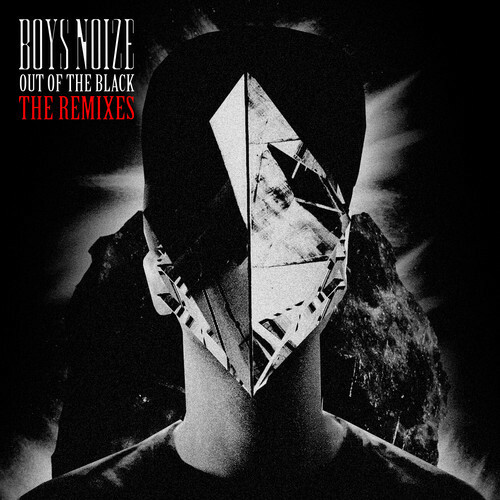 ‘Out of the Black – The Remixes’ will be released on 3 February, 2014.